Last stronghold of human dignity. Bathtubs are basically infinite size beakers, making them ideal for hobo chemistry and mass drug production. 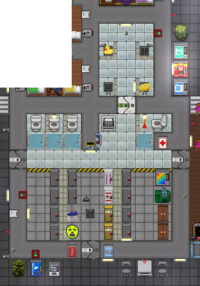 Toilets can be used to stash items; simply click on them with the item to put things in, and click drag the toilet's sprite onto your character's to take things out. 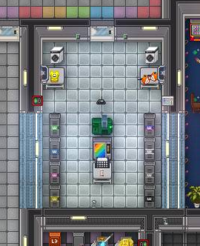 Sinks will quickly wash your clothes and other items of any visible blood stains, and the washing machines to permanently remove any "blood-stained"/"piss-soaked/"puke-covered" modifiers from your clothes in case Security starts getting smart with its forensics. There's also racks of towels and bedsheets and loads of generic jumpsuits and knit caps in all sorts of colors, as well as a uniform manufacturer that can make more of them and a few other things. The Health Spa room has a few small candles for tasteful furnishing, as well as wardrobe of bathrobes and fuzzy slippers. There is also a tanning bed straight from Space Hawaii, so you have the ghostly white palor or deep-fried quantum cake pizza sandwich tan you've always wanted, and more, without having to talk to those awkward (but well-meaning) Geneticists. Crowbar the tanning bed and change the lighting tubes to get all sorts of bizarre skin tones. The APC for this room is located in the maintenance tunnel below it. This room receives power via a wire that goes through the southern door of the white-tiled room. Recalling fond memories of high-school hallways and gym class. 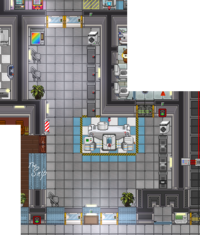 This Locker Room is a parlor of sorts for Crew Quarters and the Barbershop, and it serves a different purpose from its Cogmap2 counterpart. It has an array of personal lockers, claimable by swiping an ID card on them, each filled with a spare headset, backpack, satchel, and, for some reason, a remote signaler. There's a few washing machines here, for completely removing the puke/blood/piss out of your clothes, and a unisex bathroom nearby with bathtub and shower facilities. There's also a FancyPants Sew-o-matic here, so you can outfit yourself in something more modern and fashionable than a black/grey/white generic jumpsuit and knit cap from the wardrobe lockers. Hack to get fine wedding garb. If you want to get away from these lockers in particular or leave the game in general for a short while (to eat/make lunch, for example), you can click on the honking huge Industrial Cryogenics Unit sitting in the middle of this place to enter "cryosleep" for 15 minutes or more. After the quarter hour is over, you can then pop out to rejoin the game, safely thawed out and ready for more SS13. This room has no vents. Nothing can get into these lockers. Not even gas physics. The APC for this room is located in the maintenance tunnel to the right of it. The functions of the Locker Rooms of other maps have been chewed up, spit out, and booed off stage and redelegated to Toilets, the alley below it, and the Laundry Room. This Locker Room just below the Crew Quarters is where the crew of the NSS Clarion go to relieve themselves and clean up after a hard day's (?) work. Because this is usually a map for the Goon RP #1 server, the facilities here actually do something. There's bladder-aiding toilets, hygiene-boosting showers, and most importantly, a neat hat for Staff Assistants a plunger. Remember, you can relieve yourself on the toilet by standing over it and either using the pee emote or say "*pee. This is also where crew members go to get dressed for all sorts of occasions. There's various masks here for spicing up your wrestling matches and swimming gear for a dip in the pool nearby. Various uniform lockers are in here, for people transferring into other jobs, and for more general occasions, there's uniform manufacturer for making generic clothing and a FancyPants Sew-o-matic here for outfitting yourself in something more fashionable than a generic jumpsuit and knit cap. Hack to get fine wedding garb. If you need a place to store your old clothes or anything else, there's an vast array of personal lockers, claimable by swiping an ID card on them, each filled with a spare headset, backpack, satchel, and, for some reason, a remote signaler. This room has no vents. That grate in the middle is actually a drain. The APC for this room is located in the hallway left of this room. This Locker Room right next door to the Nerd Dungeon is Oshan Lab's primary locker storage room. Lockers of what, you may ask? Clothes! Yellow clothes, purple clothes, green clothes, grey clothes--if it's part of ROY G. BIV and the white-grey-black morality trio, then there's a whole locker of knit caps and generic jumpsuits in that color here. Should it somehow run out, there's a uniform manufacturer to restock them and plenty of sheets to refill its supply of cotton. If you fancy fancy wear, look no farther than the FancyPants Sew-o-matic. This colorful vending-machine-sewing-machine combo can be hacked to supply fine formalwear, which is guaranteed to be a hit at the next funeral in the Chapel nearby. Also, if you're in for a swim sometime soon, swing by and pick up the water wings, inner tube, and/or flippers here. You (probably) won't regret it! Also, if your clothes get so stained that there's more blood/urine/vomit/gib than actual clothing fiber, the sinks and washing machines here will cleanse it all out, in 3 minutes or less. This room has no vents. Clothes and vents simply do not go together. The APC for this room is on the right wall, somewhat towards the northeast corner. This page was last modified on 21 April 2019, at 21:23.